Another CES has come and gone, and like the rest of them, 2018’s event was bursting at the seams with cool new products (and technologies). Whittling down all of what we saw over the course of a week to a simple list of 10 isn’t easy, but neither is waiting for these products to make their way to market. CES 2018 is a wrap, and while it was a fantastic event, this year’s was also one of the most grueling. There was much to take in, as always, and many flight hassles to contend with afterwards. But, flight hassles mean one thing: more time to ponder about “Best of” choices. After all is said and done, we’ve come up with 10 choices, and they’re all over the map. These are products (or technologies) that stuck with us long after our meetings. Products that we ourselves would love to own, or at least see huge potential in. That all said, given our meetings lead us to specific companies and areas of expertise, we’re definitely missing a whack of items that are sure to belong here. There’s only so much time, and so much manpower, during one of the biggest tech events of the year. Nonetheless, we hope that you enjoy our choices. This year, our choices include AORUS’ K9 optical keyboard, ASUS’ portable ZenScreen monitor, ASUSTOR’s latest budget NASes, Brilliant’s smart home control switch, Corsair’s K63 wireless keyboard, Dell’s XPS 13 notebook, HTC’s (kind of second-gen) Vive Pro VR kit, Lenovo’s Miix 630 Snapdragon-infused 2-in-1, NVIDIA’s Big Format Gaming Displays, and finally, Sony’s X1 Ultimate TV processor. Remember when the CHERRY MX explosion happened a few years ago? While not an unknown switch, it’s as if a light bulb turned on – before we knew it, every company seemed to have a mechanical plank. Therefore, it’s become increasingly challenging for companies to iterate enough to lure people over to new product. Can AORUS do it with its K9 Optical? Chances are good. Despite its name, this isn’t a keyboard for the dogs. Every key features an optical switch from Flaretech, allowing users to easily remove and swap them around. If you don’t care about swapping to different switches for a more comfortable feel, you can probably at least appreciate the ability to remove all of your keys and clean the board with ease. Either way, you’ll enjoy an “unbelievable” debounce time, of 0.03ms (vs. 0.2ms of a traditional switch). 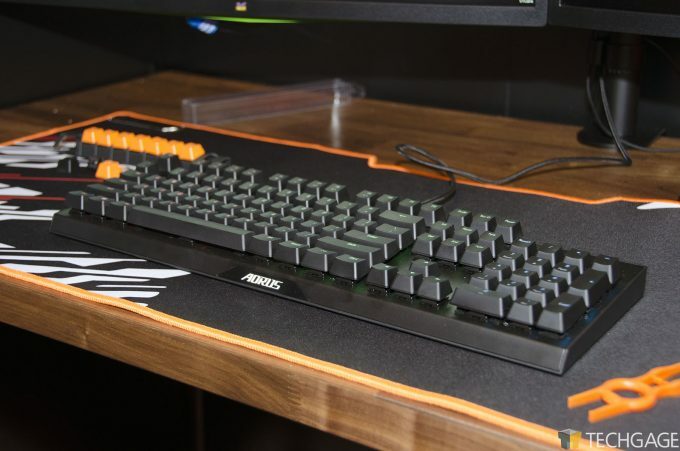 At Computex last year, AORUS had this keyboard on display, and it was pretty hard to miss. After all, you don’t see too many companies pouring a continuous stream of water over their peripherals. While I don’t think AORUS suggests you use the K9 in the bath, a little wet isn’t going to affect it. As we understand it, the K9 Optical isn’t going to break many bank accounts, costing around ~$130 USD. For a keyboard with this feature-set and performance, that seems pretty reasonable. Getting work done on-the-go can be tough, and often frustrating. That’s especially true when you’re sitting in a hotel room wanting to get work done, only to wish that you had a larger monitor handy to introduce more sanity to your work flow. Fortunately, the solution is actually quite simple. 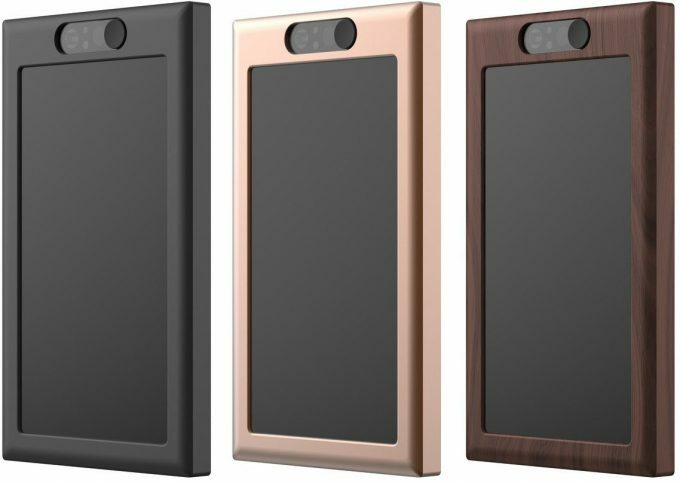 ASUS’ ZenScreen GO’s name doesn’t hide much about itself. This is a portable monitor for those who either want to replace the itty bitty screen on their notebook, or complement it with a second screen. It comes in at 15.6″, so you won’t have to squint when looking at its 1080p resolution. Because it’s not a 15.6″ notebook we’re dealing with, the full product here would weigh significantly less, and be able to fit into luggage (or a bag) much easier. 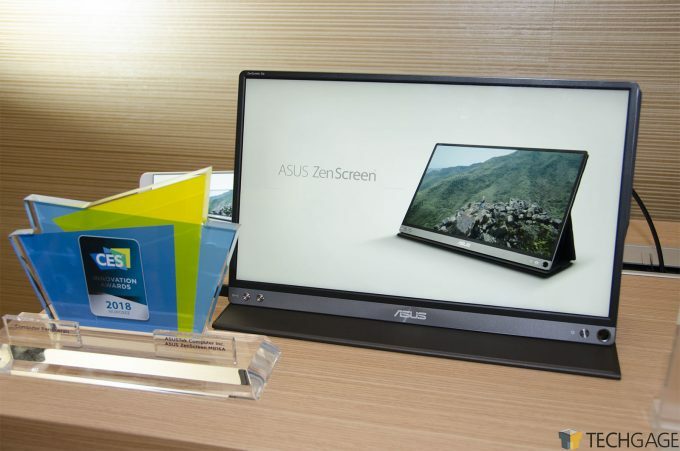 This isn’t the first mobile monitor ASUS has crafted, but it’s definitely the most attractive option we’ve seen to date. Simply put, the ZenScreen GO MB16AP looks to be the ideal solution for the worker on-the-go, or even someone who wants to work in different parts of their house. It’s a simple product, but one that’s been executed beautifully. Sadly, there’s no pricing information available right now, but we’ll continue to “monitor” it. Today’s NASes are feature-packed to the point where it’s very difficult for companies like ASUSTOR to “wow” us. At the same time, it doesn’t always take that much to win us over. You just have to do something really well, and if “good value” is tied in with that, then that’s even better. How ASUSTOR won us over at this CES was with the introduction of its AS4002T and AS4004T NASes, models targeting mainstream audiences looking for the best bang-for-the-buck. To our knowledge, the AS4002T marks the first NAS with 10G Ethernet onboard for a 2-bay model, and especially for one expected to retail for around $259~290 (2-bay; $395~460 for the 4-bay). Today’s biggest hard drives can exceed a 1Gbps pipe without issue, especially with large sustained transfers, and SATA SSDs can easily exceed that (by a factor of 5 or 6). With 10Gbps available, you’ll be able to access your network storage at native bandwidth speeds (network latency aside). With the 4-bay model, a RAID 0 SSD setup alongside mechanical storage RAID 1 sounds like a tasty setup for creative work. Smart home products have been a dime a dozen at every recent CES, so it’s pretty difficult for one product to stand out of the crowd – especially when we don’t particularly pay huge attention to the market. Well, Brilliant impressed us with its “Brilliant Control”; not because it does anything new, per se, but because it takes the best of smart home device features and puts them into an easy-to-use package. Having a smart home doesn’t need to be difficult (unless you want it to be). Brilliant’s Control is called a “switch”, but few are going to look at it and think it relates to an actual light switch. Yet, it can act as one. It can also listen to your voice, and because the entire switch is a touch pad, you can use your fingers, too. What’s really cool about Brilliant Control is the fact that you can teleconference with someone else in the house. That could be useful if you want to make sure little Jack or Jill are actually cleaning their rooms, or if you simply want to terrorize guests (don’t worry, there’s a privacy option). The Brilliant Control isn’t an inexpensive solution, costing $200 per switch, but the level of convenience packed in is sure to lure many who want a quality setup without having to go a more complex route. Amazon Alexa is built-in, so this switch’s functionality out-of-the-gate is very strong. Competitive gamers don’t want to be wireless, for what we’re sure are obvious reasons. 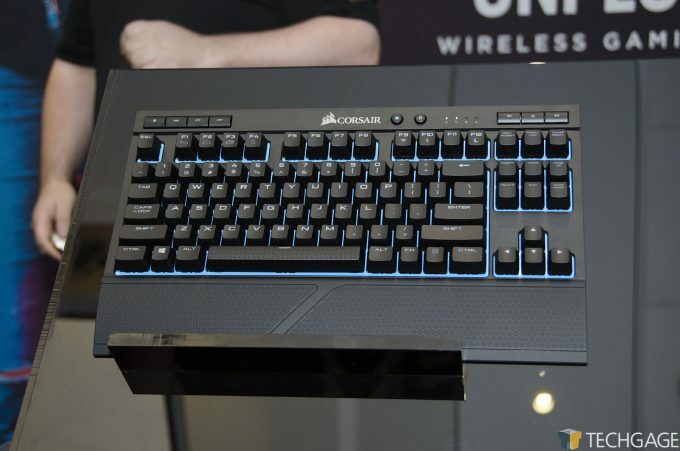 But with its new K63 keyboard and lapboard, Corsair is confident that those same gamers should consider opening up to the idea. With its ‘Unplug and Play’ mantra, Corsair employs the fastest wireless solution it can, bringing latency down to 1ms – on par with the best wired gaming mice. To help put the differences into perspective, a standard Bluetooth connection can hover around 7 or 8ms, which assumes you have a strong connection. It’d only get worse the further you are away from the receiver. If you find yourself with low battery, or in a room with so much signal noise that it creates additional problems, you can easily plug the keyboard in with its included USB cable and avoid all possible pitfalls. Unlike some of the products in this list, the K63 and its lapboard complement are available right now. The keyboard itself can be had for $110 USD, while the bundle with the lapboard brings that up to $160. One of the great things about CES is that year after year, we continually see refinements made to our favorite tech products. That’s especially true with aesthetics. 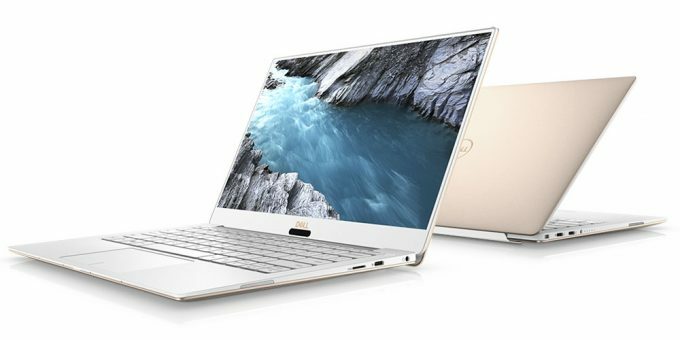 Dell’s XPS 13 is no stranger to winning awards, and it’s because the company clearly loves receiving them enough to make sure each new iteration is enough of an improvement over the last. As mentioned in our pre-CES post about this notebook, Dell wanted to make sure that the new XPS 13 looked good on day 1, and day 1,000. Even the palm rest had some TLC applied to it, with its 9 layer interwoven material that’s comfortable to rest your hand on, and resistant enough to shun spills and stains (provided you tend to them quick enough). Thanks to the inclusion of “Gore Thermal Insulation”, long use shouldn’t create uncomfortable heat. We were told that even when the new XPS 13 was torture tested with aggressive tests, the super-thin notebook could still keep calm under the stress, without notable performance degradation. And speaking of performance, this notebook includes Intel’s latest 8th gen processors, up to 16GB of memory, and up to a 1TB PCIe SSD. If you’re not adverse to splurging a bit, you can also convert the screen from non-touch 1080p to touch 3200×1800 – a resolution that should be sufficiently crisp for a 13.3″ screen. Dell’s XPS 13 is one of those rare notebooks that sees fans eagerly await the next release, just as people have begun anticipating the next hot new phone. How will Dell outdo itself next year? We’re excited to find out. Ever since Oculus released its Rift, and HTC, its Vive, we’ve endured a countless number of rumors surrounding upgraded hardware. 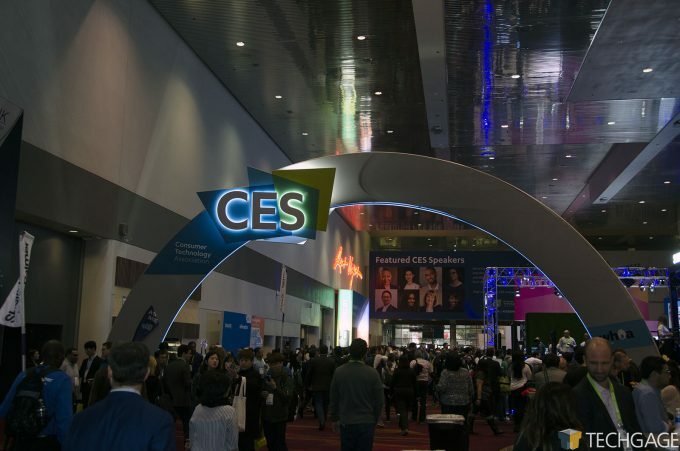 At CES, one of these camps gave us something to work with, and to say we’re excited about it would be a huge understatement. HTC’s Vive Pro, in some ways, is ideally what we would have seen from the get-go. That’s something that could be repeated when the next iteration comes along, because at this point in time, there’s still a ton of room for improvement; it means any new device is going to encompass a huge list of refinements over its predecessor. If an “ultimate” in VR exists, finding a well-supported headset with huge resolution is a good start. In the Vive Pro’s case, the resolution is 78% better than the original, and that’s a change that’s easily noticed in the real-world. In quick tests, the screendoor effect wasn’t invisible, but it was much less pronounced than on the original Vive, as well as its competitors. 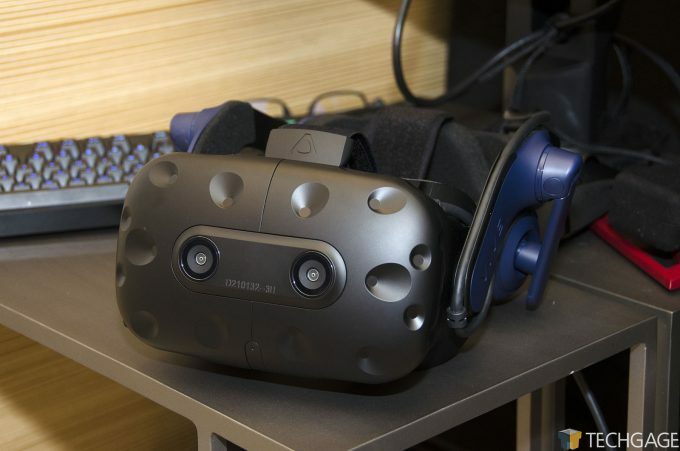 In addition to a clearer picture (and greater GPU requirement, it must be said), the Vive Pro also buffs up its audio capabilities, and last, but not least, can be used wirelessly, thanks to the help of Intel’s WiGig technology. At this point, we’re still waiting on pricing, and a release date, but we don’t need that information to know how much we want one. Qualcomm has been talking a lot about “always connected” PCs, and at this year’s CES, we were given our biggest hint yet that such notebooks are soon to hit the market. In particular, Lenovo had an exciting model on display, and with it comes an interesting name: Miix 630. 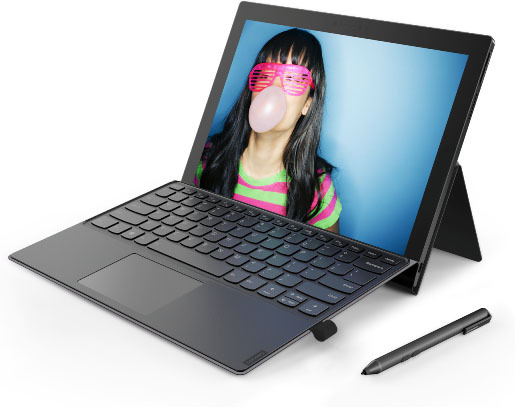 This 2-in-1 hybrid comes in a 12.3″ form-factor, so it will easily fit in your bag. The notebook includes a stylus, which would be useful when holding the unit like an actual notebook, or slate. With its built-in 4G connection, it means users can remain connected all day, just as they are with their smartphone. Being a notebook built around a chip ultimately destined for mobile devices – namely, smartphones – the ultimate in performance shouldn’t be expected from notebooks like the Miix 630. Still, there’s a decent amount of memory on tap (up to 8GB), as well as a crisp (for a 12″ screen) 1080p resolution. For processing duties, Qualcomm’s Snapdragon 835 CPU with Adreno 540 GPU will deliver more than enough performance to get work done while on-the-go. As with most (or perhaps all) Snapdragon-infused notebooks so far, Microsoft’s more limited Windows 10 S is bundled in. Fortunately, that can be upgraded to other versions, if the user chooses to, allowing them to install a much wider range of x86-based applications. All we’re missing at this point is the iconic red TrackPoint button. 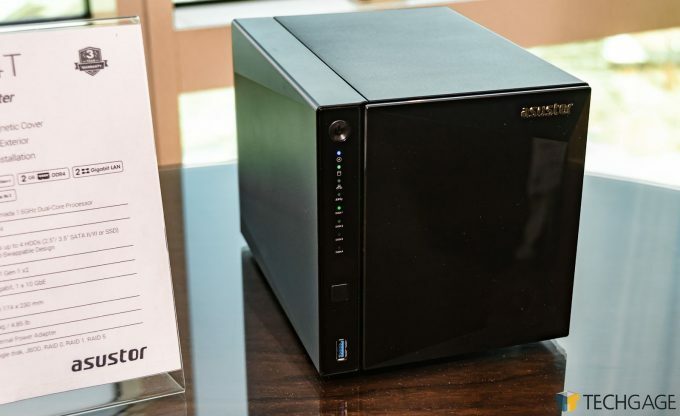 There were many displays at this year’s CES that caught our eye, but none quite like the “BFGD” models that were being shown off in NVIDIA’s hotel suite. What’s not to like? Well, aside from what’s sure to be a really high price tag, that is. At 65″, this is the way a 4K game was meant to be played. Anything better than 60Hz for 4K is rare, yet this mammoth panel supports 120Hz (one panel vendor supplies all of the BFGD models right now). While many games are going to require some serious GPU horsepower to hit those kinds of frame rates, a game like Destiny 2 can easily exceed 60 FPS on current-gen GeForce cards. These monitors are not going to be inexpensive, but they’re pretty much as “ultimate” as it gets right now. Some could argue that 5K panels would have been nice to see, but we don’t think so. From hands-on experience, we can attest that the gameplay looks ridiculously crisp when sitting at a reasonable distance from the screen (5’+). 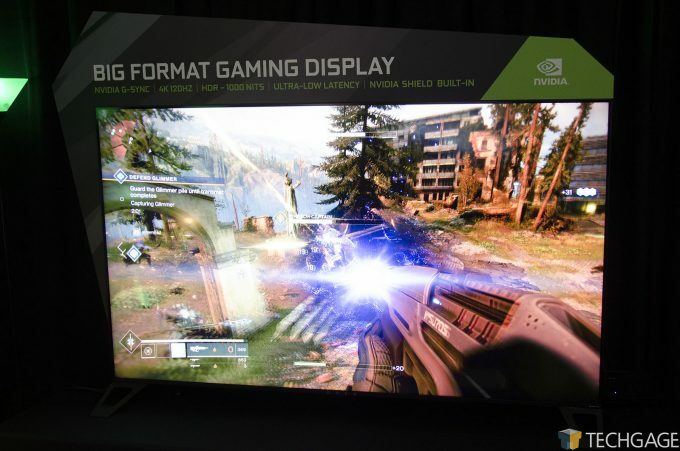 4K will allow a single high-end GeForce to deliver beyond 60 FPS performance in many popular games, and since most titles don’t currently use multiple GPUs too well, 4K will actually allow people to hit 120 FPS on these gorgeous displays. Here’s a bit of a strange choice. It’s not a product per se, but rather a product that goes into another product. 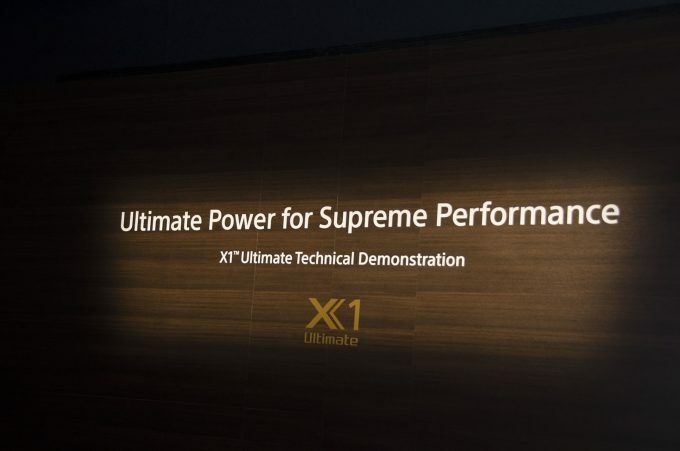 It also happens to be an important product, because this X1 Ultimate processor delivered the best image quality we’ve ever seen, complemented by a Sony full-spec HDR prototype 8K display. Having been to CES many times since Techgage‘s inception, there have been multiple times where image quality shown off made us grin. But this demo was different. We’ve seen 8K content in the past, but what was exhibited at CES by Sony was as “lifelike” as we’ve ever seen before. The clarity was simply astonishing, and even a little inspiring. “Jaw-dropping” gets thrown around a lot, but that was a legitimate reaction here. Sony’s X1 Ultimate processor paves the way for even better TVs. As our content continues to improve, both with higher resolutions and an HDR coat of paint, the processing power required to churn through this content requires further performance improvements. We can say one thing for sure: we can’t wait for this technology to hit the market. Although, based on the current 4K content situation, it’s likely to take some time before we ever see content with quality on par with what we saw from tech demos on display here. But still… we have a feeling that the wait for this is going to be worth it.